Now that you know which size truck bed you have, you can begin taking measurements for your new toolbox. It’s key to properly measure your truck bed for a toolbox. First, measure the height of the rails and the distance between the rails. For crossover toolboxes, be sure to properly measure the distance from the outside of one rail to the outside of the other. If you’re unsure of how to do this, you can contact the toolbox manufacturer for assistance. Measure the distance between the bulkhead and the forward edge of the wheel well. It’s important to note that some short bed trucks may not be long enough for larger toolboxes. 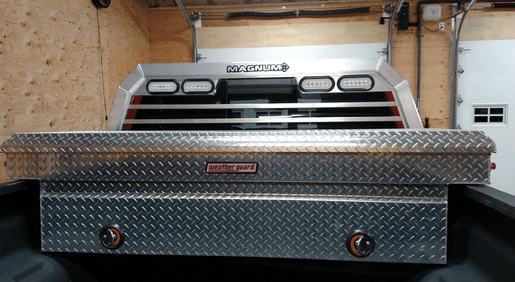 Depending on the type of toolbox and the brand, the box will either attach to the truck by a J-bolt, or by drilling holes into the truck itself. If you do not want to damage your truck during the toolbox installation process, be sure you choose one that doesn’t require you to drill. Mid-size toolboxes: These are made for the beds of mid-size and compact pickups including Colorados, Tacomas, Frontiers and more. Full-size toolboxes: Created for larger trucks such as Silverados, F-150s, Sierras, Tundras, Titans and Rams. Now it’s time to consider the material of your new truck toolbox. Aluminum vs. Steel: More and more tool boxes are made out of aluminum these days because they’re lightweight, just as durable as steel and won’t corrode over time. Outdated, older designs of toolboxes will use steel and then paint a corrosion-resistant finish over it. However, this won’t prevent the toolbox from rusting in some areas which gives it an unsightly look. Ultimately, aluminum is the superior choice of material for your toolbox. Next, consider whether or not your truck toolbox will fit properly on your truck with your other truck accessories such as your truck rack, bedrails or tonneau cover. If you aren’t sure, reach out to the manufacturers of each truck accessory to find out. 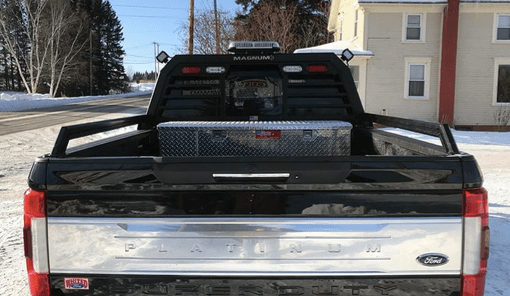 ← Is a Tonneau Cover Right for My Truck?